There has been some discussion of diagnosing diabetes type going on in my comments of late and I thought this might be a good post to bump in response. It's pretty specific, but contains links to some background blogging. I think it would be safe to say that I'm of the belief -- and the scientific evidence seems overwhelming in support -- that peripheral insulin resistance is either non-existent or plays a minor role in T2 diabetes. Nonetheless, the concept of IR remains, but for the most part is diagnosed using a fasting HOMA-IR score based on fasting insulin and glucose levels. This is considered a measure of hepatic IR, but even here appears to be a flawed measure. The "swamped insulin receptor" model is flawed. Not saying it doesn't perhaps play a role, but glucose uptake is not the first defect nor the main determinant of elevated circulating glucose. There is much evidence for the latter, and the former? Well, it seems the evidence points far more conclusively to relative insulin deficiency vs. any sort of receptor swamping dysfunctional clogged sink model. This is also why I believe LC will never "cure" T2, because the GSIS is the first thing to go with chronic carb restriction. This is well known and why low carbers are told to "carb load" with 150 grams for several days before a standard OGTT. Insulin does far more than regulate blood glucose levels, it should be a no brainer in my opinion to aim for NORMAL insulin signaling/glucose regulation where possible. Another one that fell through the cracks in the draft bin. A continuation of the posts discussing: β-Cell dysfunction vs insulin resistance in type 2 diabetes: the eternal “chicken and egg” question. The primary post on this article here. There may be some repetition from other posts that have been published in the interim, but what the heck, I'm publishing it up. I've screenshot and C&P'd the relevant section that I'll be discussing in this post. If it is difficult to read, etc., you can of course go to the original paper. The main point of this section is to highlight the loss of first phase insulin secretion that precedes frank diabetes. In Figure 2 we see that the (yellow) NGT response is a spike in insulin production within the first few minutes. Insulin secretion is biphasic in response to either glucose or amino acid stimuli. Glucose caused a much more pronounced first phase release than did a complete amino acid mixture; whereas glucose and the amino acid mixture stimulated late second phase insulin secretion equipotently. An increasing body of evidence indicates that the early insulin response following glucose ingestion plays a critical role in the maintenance of postprandial glucose homeostasis. The early surge in insulin concentration is capable of limiting the initial glucose excursion mainly through the prompt inhibition of endogenous glucose production, with the insulin mediated curtailment of glucagon secretion being particularly relevant. If this is so, the insulin content of the β-cell cannot be rapidly replenished after acute stimulation of insulin release by FFA. Under normal circumstances, only a small proportion of the β-cell’s insulin intracellular store is released after an acute stimulation by a secretagogue, so that short-term FFA-induced insulin release would have little adverse effect on the β-cell’s secretory capacity. However, chronic exposure to FFA could severely deplete the internal insulin stores since there is apparently no biosynthetic backup to compensate for FFA-induced insulin hypersecretion. This may be one reason why low carb diets don't appear to improve insulin secretion similarly to interventions like the "crash diet". I blogged about this study a while back demonstrating that NEFA release from adipocytes is not appropriately suppressed with a low carb diet. In summary, while this is by no means comprehensive, I'd like to revisit in the near future, the dietary causes, if any, and the scientific evidence of same, in the development and/or progression of type 2 diabetes and wanted to publish this up as background. Without any reasonable doubt there IS a preponderance of evidence that there IS a certain link between diet and type 2 diabetes. But it's probably neither carbs nor fat percentage, but general overnutrition and resulting obesity. Of course there is a chance to develop T2D after being slim for a lifetime, but it's comparably small, like the chance to suffer CVD with a lifelong low bloodpressure and low LDL-C. Yet there clearly is a direct link between obesity and T2D and fattening people will give them T2D with good certainty. "...loss of first-phase insulin secretion does not appear to be the primary defect responsible for NIDDM. Recent studies have shown that progression from normal to IGT or to NIDDM is associated with a reduction in insulin sensitivity and an increase in insulin secretion with an intact first-phase response. 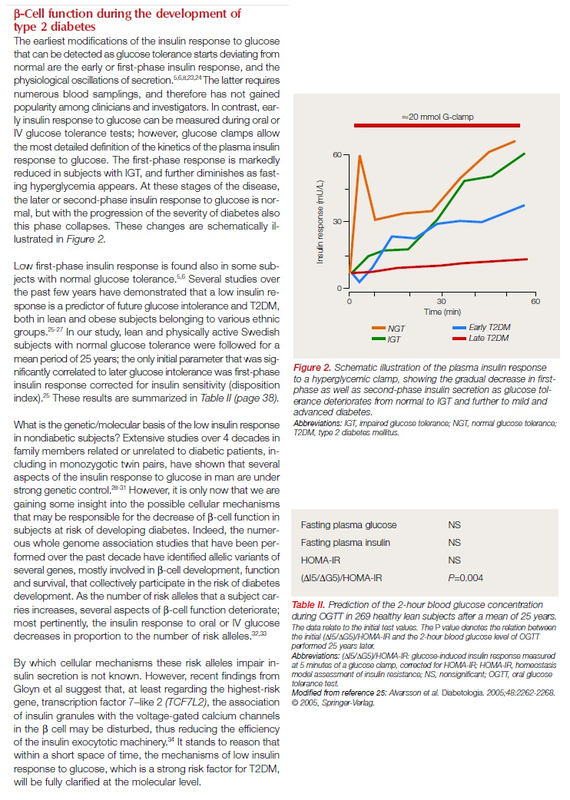 Although the first-phase response is characteristically lost in patients with well-established NIDDM, this defect does not occur until the fasting plasma glucose concentration rises to 115-120mg/dl. Moreover, tight metabolic control partially restores the defect in first-phase insulin response, indicating that the defect is acquired and not inherited." So if one's fasting BG is below 115mg/dl there appears to still be room to turn things around (i.e., get that accumulated fat out of your liver and pancreas). "In the past, it was recommended that the patient should consume a diet containing 250g of carbohydrate or more, and calories for maintenance of body weight, for at least 3 days before the test [GTT] to obtain the best reproducibility of the test and to minimize falsely abnormal results. Ingestion of smaller amounts of carbohydrate (150 to 200g) is probably sufficient to prevent plateau or diabetic-type curves in healthy subjects. Presently, no formal dietary preparation is recommended unless it is estimated that less than 150g of carbohydrate per day has been consumed. A LOW CARBOHYDRATE DIET PRECEDING THE GLUCOSE TOLERANCE TEST OBLITERATES THE FIRST-PHASE INSULIN RESPONSE TO ADMINISTERED GLUCOSE THAT IS MOST IMPORTANT IN DETERMINING NORMAL GLUCOSE TOLERANCE." It's pathetic that the LCHF camp resorts to - in your case - ungentlemanly attacks when they cannot respond to facts. This brings my next off topic question: Are there any peer reviewed studies conducted by any of the LCHF gurus, Feinman, the comedian, Dr. Eades, Swede doctor, Taubes, Dr. Attia, Jimmy, Sisson, Dr. Davis and anybody else I have missed? True, and yet we still have more of this. . . This would explain LCers that are wedded to their blood glucose monitors becoming carb cripples. If you're eating LC and then have a carby meal and you don't have the insulin spike, glucose goes up up up and stays up for far too long and oh noes I have the beetus!! Of particular importance: "The fasting NEFA concentration was increased on a low-carbohydrate diet in spite of a rise in the plasma concentrations of insulin and glucose to levels which, with a high-carbohydrate diet, would have lowered the plasma concentration of NEFA." Steve Phinney would likely say: "Unfair! Not enough time for adaptation to the low-carb intake." Peter 'Hyperlipid' believes that the "physiological insulin resistance" that necessarily occurs with low-carb intakes can be very easily reversed by a few days of increased carbs. Randle, however, reported that "after resumption of the normal diet the plasma concentrations [of insulin and NEFA's] returned slowly to normal, BUT DEFINITE ABNORMALITIES WERE STILL FOUND AFTER FOURTEEN DAYS, AND SOME MAY HAVE PERSISTED FOR THIRTY-FIVE DAYS." Any thoughts about how this playse out with beta cells exposed to NEFA for longer than "normal" - the intermittent fasters vs 3-meals-per-day, but still short compared to long term low-carbing? DeFronzo's article is what's used in diabetes literature and is considered fairly accurate. 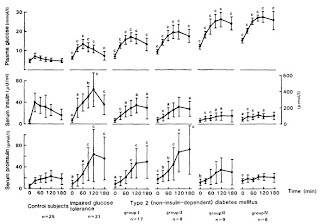 That's why the FBG and A1c are considered reliable tests for diagnosing T2 diabetes: "Recent studies have shown that progression from normal to IGT or to NIDDM is associated with a reduction in insulin sensitivity and an increase in insulin secretion with an intact first-phase response." 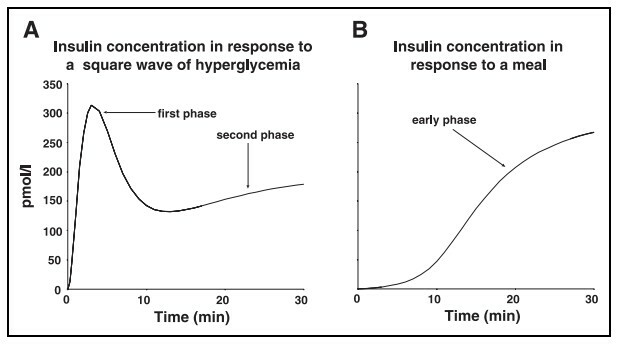 The first phase insulin response does deteriorate but after the two steps above. That's why there is a convergence between the FBG >125 and A1c>6.5 criteria. When the fasting rises to 125, then you've lost glucose tolerance and can't pass the OGTT. 6.5 is the mean BG of about 145. At that level, you pretty much have irreversible insulin resistance and can't lower BG after 2H under 200. 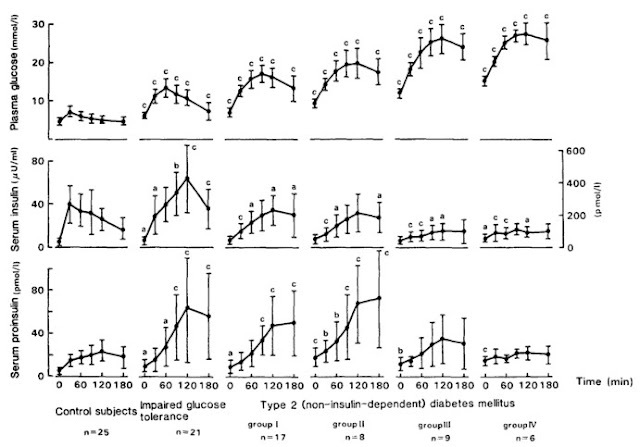 There is a typical graph that illustrates the rising FBG with the OGTT and A1c cut off points for T2D dx. Actually factors 1-3 do happen but 4 doesn't. Your fasting insulin usually stays low when you low carb, whether you are insulin sensitive or not. #4 doesn't seem to make sense. That's why one badge of honor when you low carb is low FI. But low FI doesn't necessarily indicate great insulin sensitivity, just that you don't eat much carbs. One other abnormality when you have that physiological insulin resistance is if your NEFA goes up and stays up, then you enter the state of "low T3 or euthyroid illness," bka, nonthyroid illness. Typically, sick people often develop autoimmune diseases in that kind of state. H_I_L_Y: thanks for commenting on this earlier topic. You mentioned: "When the fasting rises to 125, then you've lost glucose tolerance and can't pass the OGTT....At that level, you pretty much have irreversible insulin resistance and can't lower BG after 2H under 200." "...plasma insulin response to ingested glucose increases progressively until fasting glucose concentration reaches 120 mg/dl. Thereafter, further increases in fasting glucose level are associated with a progressive decline in insulin secretion." BG level of 150 -160 mg/dl is now secreting an amount of insulin that is similar to that in a healthy non-diabetic individual—i.e., defined by DeFronzo as having a fasting BG of 80 mg/dl. and having a mean plasma insulin concentration of ~45µU/ml." The person with a fasting BG that has climbed to 120 mg/dl now has an insulin problem, not an insulin resistance problem. Losing weight to reduce insulin resistance won't be able to fix matters now. This person is now on the wrong side of "Starling's Curve." I think we can agree that we don't ever want to be there.